On 29 September 2017, the Faculty of Arts, Communication and Education (FACE) was honoured to welcome the delegation from SMK Machang Bubok, Bukit Mertajam, Penang to Infrastructure University Kuala Lumpur (IUKL). It was an educational visit and a workshop on teamwork via English language activities. 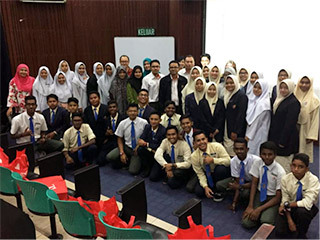 The objective of the visit was to give students the chance to build closer bonds with their schoolmates, experience new environments and enjoy a day away from the classroom. The delegation consisting of five teachers; En. Mohd Asmadi Ismail, En. Hasrol Nizam Hashim, Cik Shakinah Said and Pn. Zuriani Mohamed Nayan and 34 students who are also school prefects, arrived at 2.00 p.m. by bus. The organising committee was headed by Prof. Dr. Siti Maziha Mustapha, the Head for the Department of Education. Prof. Dr. Faridah the Executive Dean was the advisor and the other committed lecturers in the department, Pn. Suraya Amirrudin, Mr. Harold Poong Wan Hing, Ms. Cammy Low Chan Mee and Ms. Tg. Idzyan Nurain Tg. Idris helped to ensure the event was conducted smoothly. The event that started at 2.30 p.m. was held at the Auditorium. Prof. Dr. Faridah Ibrahim the Executive Dean in welcoming the delegation, advised the students to take responsibility for their education and to aim high and study hard. She also wished the students who will be sitting for their S.P.M examination in November, all the best. Prof. Dr. Faridah took the opportunity in her speech to give brief information on the programes offered in IUKL. Right after the welcoming remarks, En. Mohd Asmadi Ismail, the representative from the school was called to give his speech. He thanked the department and faculty for the warm welcome rendered to them and the students. The fun began at 3.00 p.m. There were altogether four fun activities conducted. The first activity ‘The Elephant’, was handled by Pn. Suraya. This activity tested the students’ ability to work as a team in making sure the task given is done together. As communication among members was crucial, the students were urged to communicate through written and spoken language to harness their innate ability to form lasting bonds with one another. The second activity ‘Words with Friends’ conducted by Ms. Cammy Low. For this activity, groups were given a box of 50 cards. Every card had 10 words on one side and the definitions on the other side. One person was to divide the cards equally to all the other members. One person reads the definition of the word and asks the group members to guess the word. This activity demonstrated the importance of having a huge vocabulary size and a high vocabulary, especially for communication. The third activity “Tongue Twisters” was conducted by Ms. Tg. Izdyan. The activity was an individual activity. This game was to challenge the students’ ability to read with speed. They had to complete reading the text in the shortest time possible. This tested the students’ pronunciation and speaking skills. 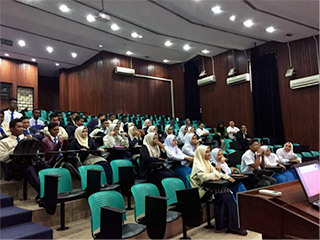 The final activity was ‘Kahoot’ and the instructor was Mr. Harold Poong. It was a meaningful online game. Students were asked to download the application from Play Store in their mobile phone. 15 questions about IUKL and FACE were asked and the students had to answer each question in 10 seconds. It was a fun activity as it verified the students’ attention to the Executive Dean’s speech earlier. The activities finished at 4.30 p.m. In conclusion, all the activities were geared to promote teamwork as the key to success in life and effective communication among the students. Right after the activities, there was a prize giving ceremony and tokens of appreciation were given to the five teachers and goody bags to the students. The representative from the school did the reciprocal action. The group photo sessions ended the event. It was indeed a memorable event for both parties.